Guys, I think he gets it. Back to discussing the game or not at all, please. I can design levels, if the offer is still up. Victorino and i added Birdo. cool so far! good luck on fixin' birdo. Victorino added a pause screen based off Super Mario Odyssey. Nice work. Aside from the little glitches Birdo seems very accurate to SMB2 from what I can remember. This is a very fun and charming project and with each update I’m more interested. cool! keep the good work. i'd say, use a dark screen filter (with a bit of transparency) rather than blur. I'm only bothered by the rapidity of the blur than it being a blur. (09-17-2018, 07:47 AM)lean i'd say, use a dark screen filter (with a bit of transparency) rather than blur. (09-17-2018, 08:15 PM)Shadow Administrator Drei I'm only bothered by the rapidity of the blur than it being a blur. Thanks for the feedback! Definitely considering it. 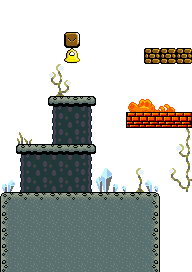 Remade the SML level to be 1-2, but with 1-1's setting and tiles. He's a sneak peak of what's to come. nice! for the sml level, i'd just change bg to a sunset-like one, since the rest is fine imo. Ok, Victorino is now in school so he can't work as much, and i remade the SML level again (because it was the wrong level.) but i'm doing something else and don't have any time to show any game footage of it. I can show this Modern ? Block however. So yes, i'm starting work on Modern 1-1. Sneak Peak of the new animations for Modern Mario. It's nice to see more progress on this project. At this point, this should be in Development Showcase. I feel like that ground pound should have a bit of a dust effect at the very least. why are floating coins not "grab-able" yet? just asking. lol. you reminded me of mario's missing: done right hack. (09-30-2018, 09:52 PM)lean lol. you reminded me of mario's missing: done right hack. That's the joke my dear. Nice! This game looks rather interesting! I like how the sprites look so far. Looking forward to seeing more of it! @lean I think Ostrich101 hasn't programmed the coins to be collected by Mario on contact yet. Oh and a few animation fixes for the Enemies and Modern Mario, but that's not special enough for a gif. Looks like a promising and cool project. Do you have any cool mechanics ideas? Maybe level gimmicks?